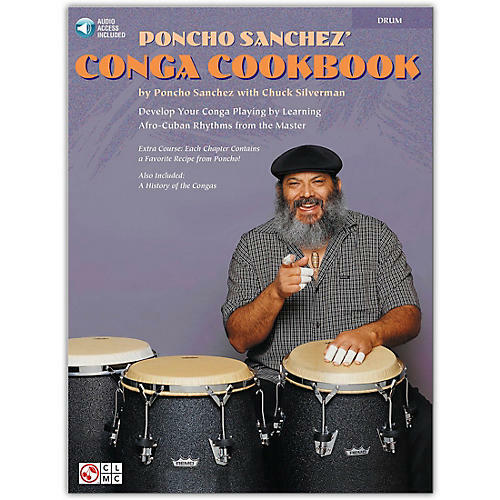 Learn conga from Poncho with this interactive book/Online Audio set! Grammy-award winning conga player Poncho Sanchez and Chuck Silverman have joined forces to produce the Poncho Sanchez Conga Cookbook that's packed with riffs for beginning conga players or percussionists who want to incorporate Latin or conga techniques into their drum playing style. This unique book/Online Audio pack covers all the essential styles you'll need, including many of the grooves that have made Poncho one of the world's most in-demand congueros. The tracks on the accompanying Online Audio are performed by a world-class band - members of the Poncho Sanchez Latin Jazz Band - with and without conga parts, so after you learn the material in the book, you'll be able to practice by playing along on your drum. Plus - there is a tasty bonus. Not only does the music have a decidedly Latin flavor, but so do the spicy hot cooking recipes from Poncho Sanchez that are interspersed throughout the Conga Cookbook!